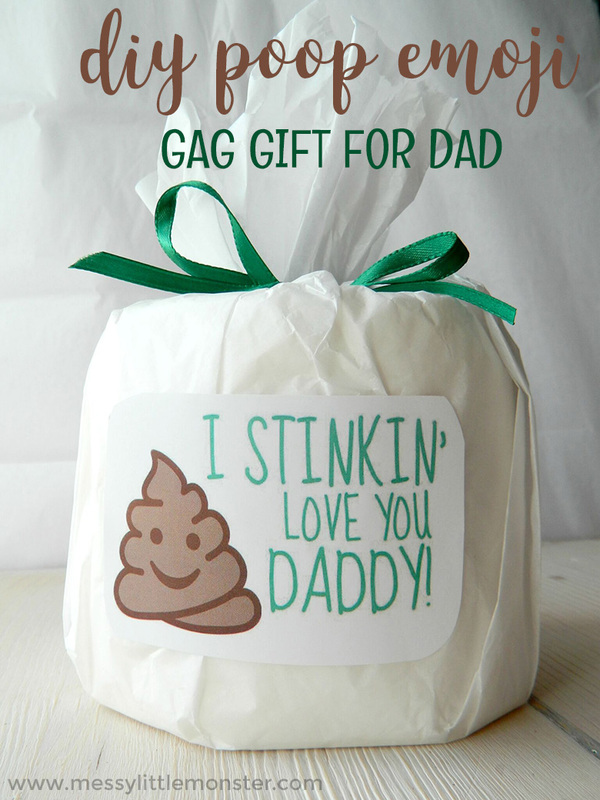 Give Dad a laugh this Father's Day with this DIY poop emoji gag gift for dad! 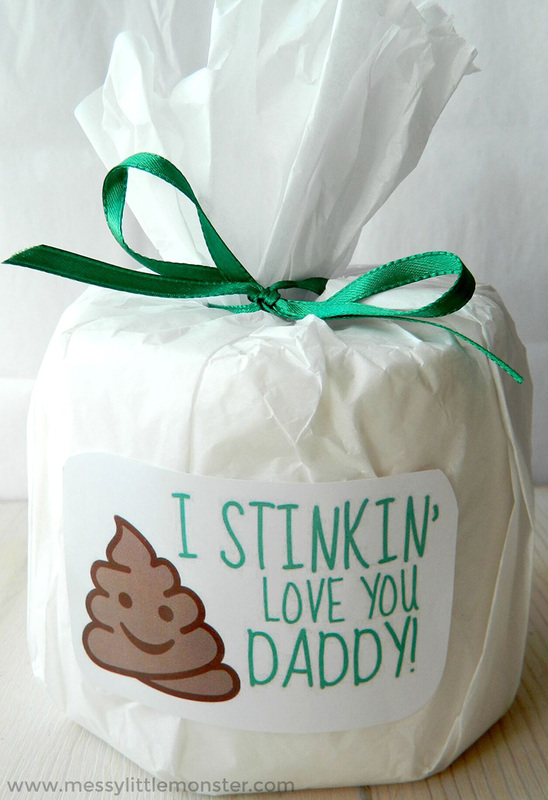 He will be sure to remember getting his own personal supply of toilet paper with this funny Father's Day gift - toddlers, preschoolers and big kids will all find making this diy gift for dad hilarious! 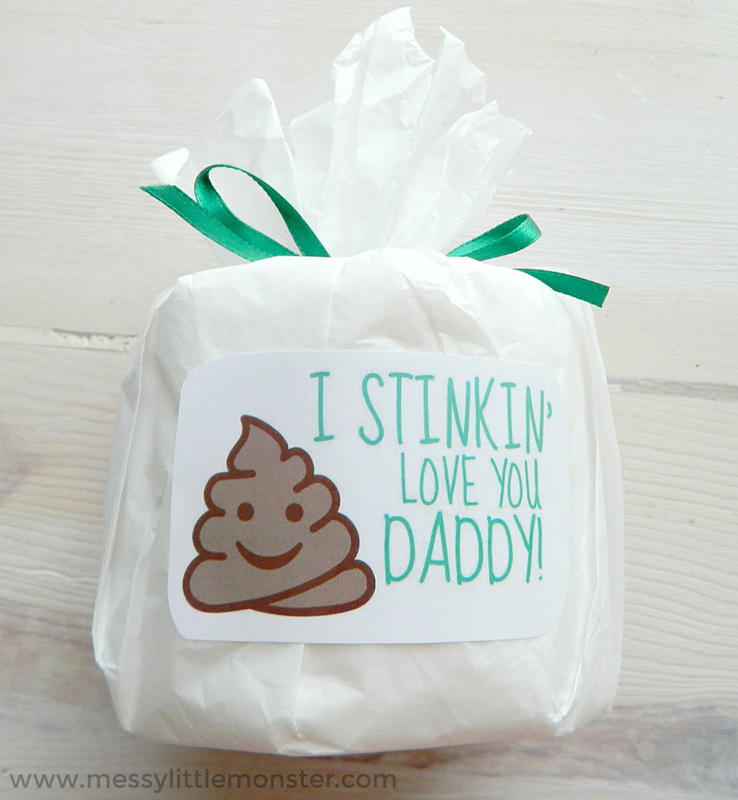 We have included free printable poop emoji labels as part of this funny father's day gift. 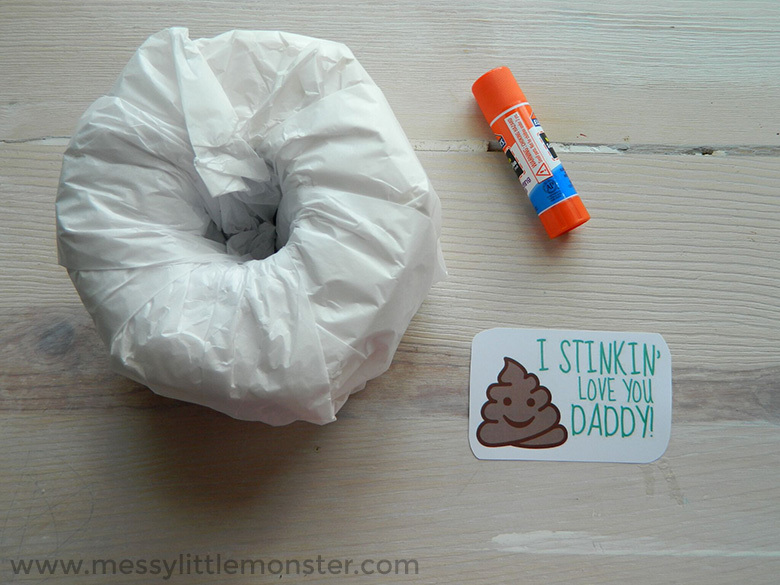 Just download and print your labels and follow the easy step by step directions to make this poop emoji gift for Father's Day! Are you looking for more fun Father's Day gifts for the kids to make for dad? Try this handmade candy beer mug which is great for kids of any age to make or this superhero Father's Day card which is a perfect Father's Day card for babies and toddlers to make Dad. Below you'll find step by step directions to make your poop emoji gag gift for dad! Toddlers, preschoolers and big kids too will be giggling the whole way as they help make this funny Father's Day gift. 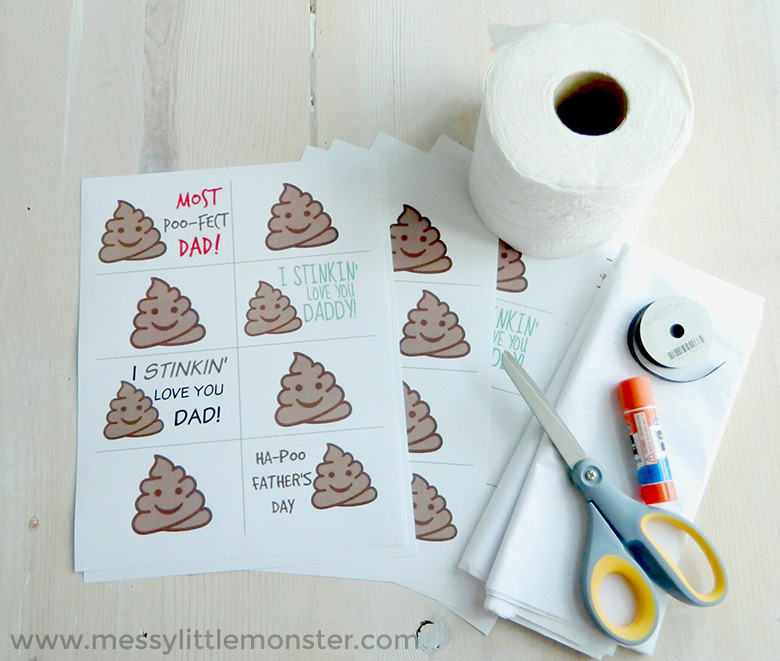 Don't forget to print and download the free printable poop emoji labels! 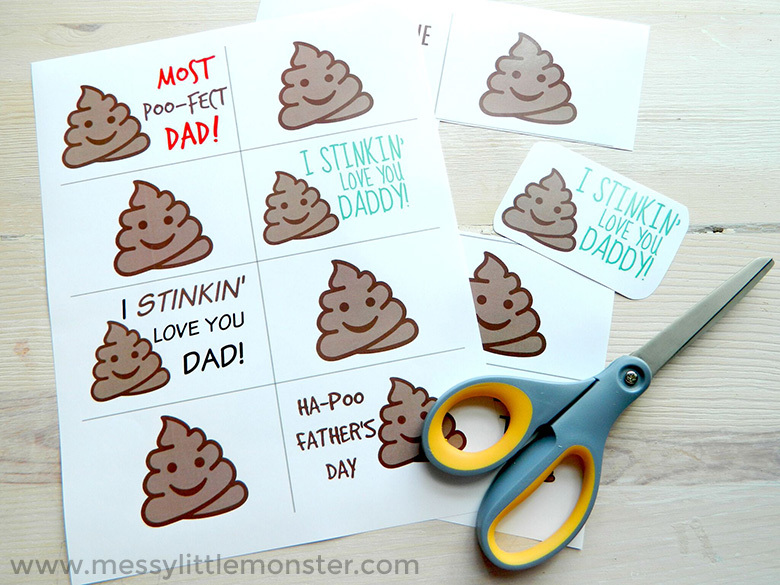 SCROLL DOWN FOR THE FREE PRINTABLE POOP EMOJI LABELS! Before you get started make sure you gather all your supplies! This makes things so much easier - especially if you're making this funny Father's Day gift with young children. Be sure to download and print your free printable poop emoji labels. You can find them by scrolling down below. 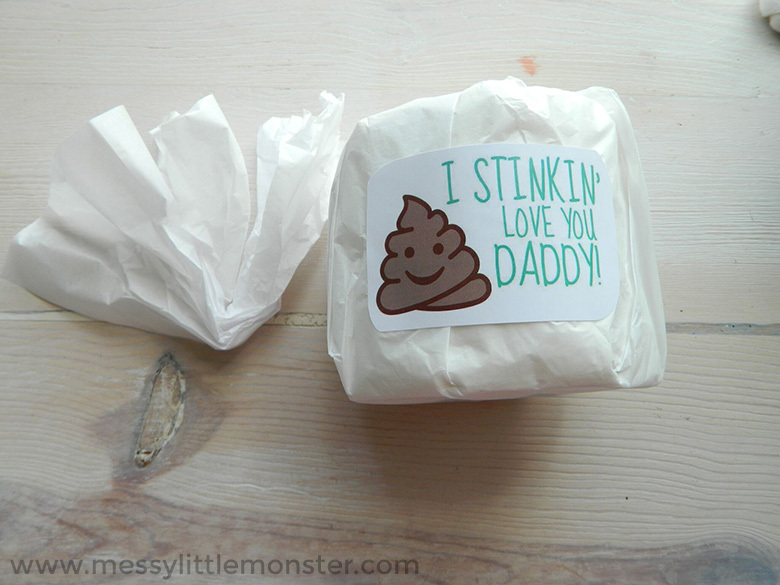 The first thing you'll want to do is prepare your free printable poop emoji labels! Assuming you already have them printed, cut each one out and round the corners to give it a more finished look. You can then set them aside, we'll need these later. I stinkin love you Daddy! I stinkin love you Dad! Now it's time to wrap your toilet paper roll in tissue paper! Toddlers or preschooler will love helping with this step. Set the roll on top of one sheet of tissue paper. Starting from the corner, pull the tissue paper upwards, making sure it's straight, and then tuck it into the center of the toilet paper roll. You'll want to go over about an inch and create a pleat, pull the paper upwards and then tuck into the center of the roll again. Repeat this until the entire roll of toilet paper is covered with the tissue paper. Make sure it's nice and secure so it stays together! Now, glue on your poop emoji labels! Cover the back of one of the labels with glue and secure onto the center of the toilet paper. For the next step you will need a little more white tissue paper. We're going to stuff this inside the center of the toilet paper roll. You'll want to gather it together in the center, fold it, and then cut in half at the fold. Then, fold it in half again and tuck it into the center of your poop emoji gag gift for dad. We're almost done with this funny Father's Day gift! Lastly, cut a 6 inch strand of ribbon. Tie it in a bow around the tissue paper in the center of your toilet paper roll. And that's it! You can repeat the steps for this poop emoji gag gift for dad if you want to use more than one of the labels. You could even make dad the whole collection! To download these printable poop emoji labels for free add $0 and click on the 'I want this' box below. It may take a moment for the page to load so please be patient. If you loved this funny Father's Day gift, you'll love these other Father's Day gift ideas! Young children can easily help with this handmade beer mug or they can use their footprints to create this superhero Father's Day card. Toddlers and preschoolers (and big kids too) will love helping to make this funny Father's Day gift! It is sure to be a gift dad will remember for a long time - getting his own personal roll of toilet paper! 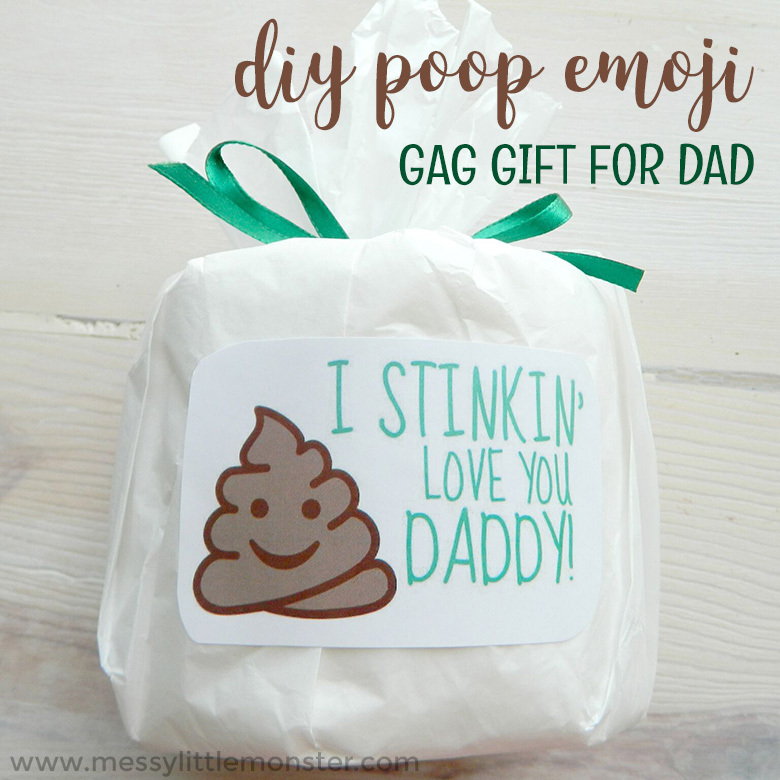 This poop emoji gag gift for dad is really easy to make and the free printable poop emoji labels add to the fun. Enjoy making your own funny Father's Day gift!